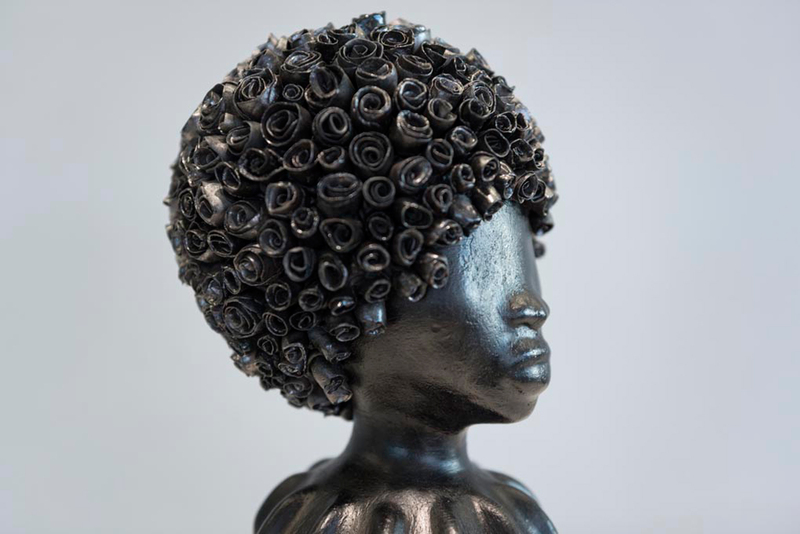 Brick House, Simone Leigh’s commission for the inaugural High Line Plinth, is a monumental 16-foot-tall bronze bust of a Black woman whose skirt resembles a clay house. The sculpture is infused with the architectural concepts and processes taken from West Africa as well as the American South: the Batammaliba architecture from Benin and Togo, the Mousgoum people of Chad and Cameroon, and the restaurant Mammy’s Cupboard, in Natchez, Mississippi. Currently in the process of being fabricated in Philadelphia at Stratton Studio, Leigh designed and constructed this massive work through a complicated and fascinating multi-step process that pays homage to these “architectures of anatomy”. 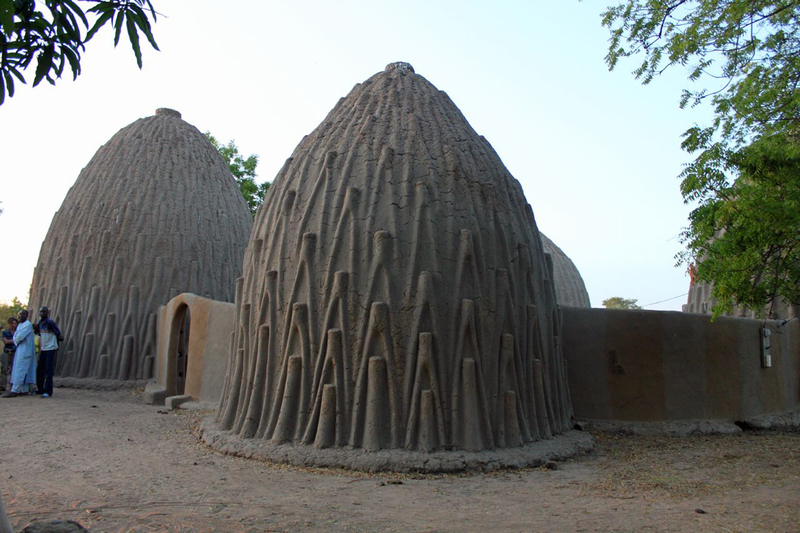 Batammaliba, the name of people of Northeast Togo, translates as “those who are the real architects of the earth.” The Batammaliba believe in the interconnected relationship between architecture, humans, and their environment. The designs of each house, place of worship, and gathering space serve as visual reminders of the human body. Within this tribe, the architects are involved in all the steps it takes to erect a structure: from conception to design to fabrication. Leigh was also inspired by Mammy’s Cupboard, another built structure that references the human form, though in a much more direct way. Built in 1940, Mammy’s Cupboard is a restaurant in Natchez, Mississippi. 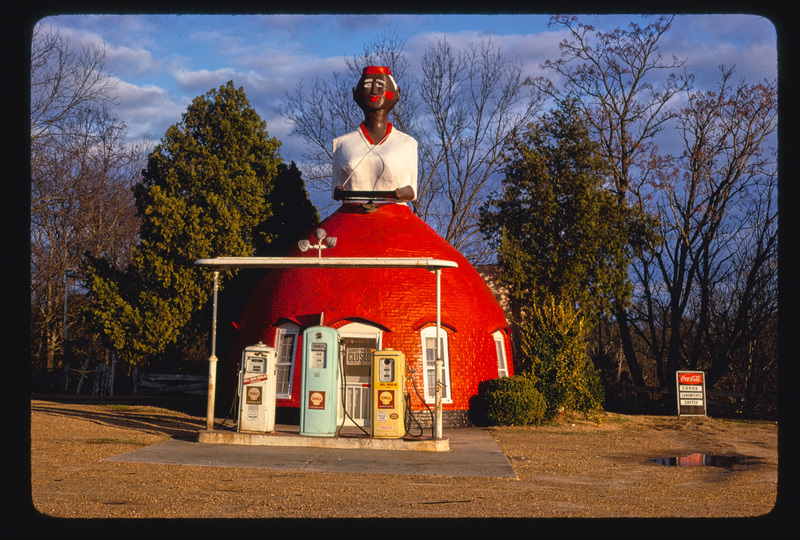 The brick restaurant is shaped like a 28-foot-tall woman wearing a round skirt that towers alongside US Highway 61. Mammy’s Cupboard originally took the guise of a darker-skinned Mammy figure, the racist archetype of a Black woman domestic worker that was prevalent in the late 19th to early 20th centuries and which was popularized in Harriet Beecher Stowe’s Uncle Tom’s Cabin and later with the character of Mammy in the film Gone with the Wind. Though repainted with a paler skin tone to downplay the resemblance to the racist stereotype, Mammy’s Cupboard remains an embodiment of the Black woman’s form as symbol for the labor she provides. That metaphor of body as function, as informed by these intersecting cultural references, provides a point of entry for understanding Leigh’s Brick House. The sculpture began as a ceramic maquette in Leigh’s Brooklyn studio that was used to create digital 3D models of the sculpture for planning and visioning of the artwork on the Spur, and also as a reference for constructing the full-scale sculpture. Then, roughly two tons of modeling clay specially chosen from a French quarry (which is said to be the one where Auguste Rodin took his clay from) were mounted onto an armature and sculpted by the team, with Simone overseeing the shapes and textures of the different elements. 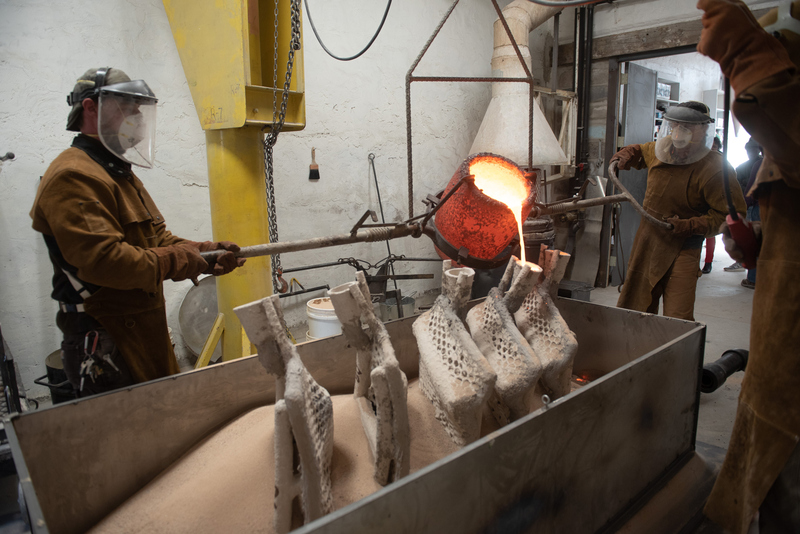 Leigh and High Line Art chose the Stratton Foundry for their experience and expertise with hand-sculpting and casting in large-scale, bronze sculpture. Often when an artist wants to create a sculpture ambitious in size, a smaller maquette will be reproduced as a full-scale foam model from which the mold is made. However, Simone had concerns that a computer generated reproduction would lose the visible, personal touches important to her process. For example, vertical, elongated ridges running along the sculpture’s base reference the ridges of teleuks—the dome-shaped dwellings of the Mousgoum, which are made from a mixture of soil, grass, and animal dung. The surfaces of Brick House were textured with sponges and steel wool to draw resemblance to the texture of the teleuk. The “skirt” of the piece can be read as the “walls” of the house, or perhaps an upturned calabash bowl. And Brick House’s braids each end in cowries, a nod toward the Batammalibian priests’ sacred geomancy shells, amongst other allusions. As you see in this photo of an earlier maquette made for the 2017 exhibition of proposals for the Plinth, Leigh originally planned to sculpt rosettes for the sculpture’s hair. The stylized rose curls would have been made from porcelain, a medium that recurs throughout Leigh’s work. However, hand-making rosettes at a Brick House scale proved too challenging, and too time-consuming. Leigh and the Stratton team then rethought the architecture of the sculpture to better fit its aesthetics and timeline. The rosette challenge resulted in a dynamic solution: Brick House would don a textured Afro with asymmetrical cornrow braids around the scalp. The work’s hanging braids were inspired by Thelma, the daughter on the 1970s television show Good Times. 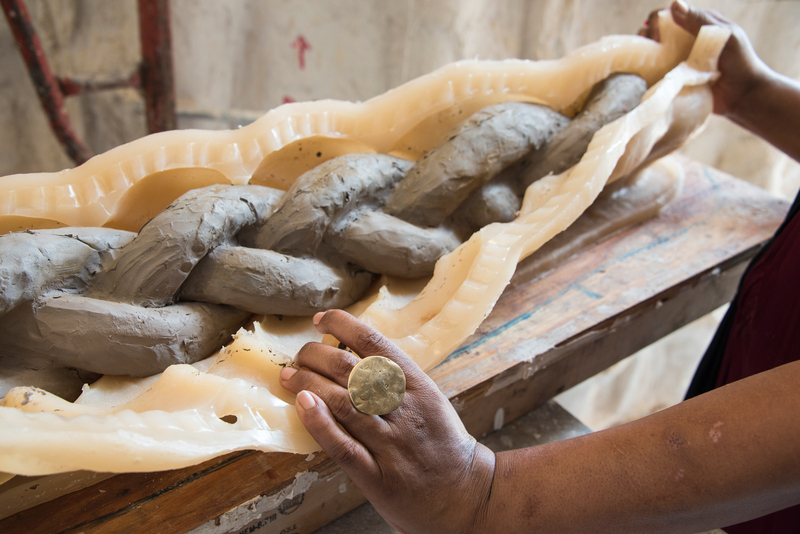 Once the clay model was completed, the team then made a plaster mold fabricated in 100 separate pieces and wax positives were created from the plaster. Next, each of the wax casts was dipped as many as or more than 20 times each into a ceramic “slurry” (a recipe of silica, or calcined clay, and a binder) that form the molds into which six thousand pounds of bronze (400lbs at a time) was poured. The bronze was melted into a crucible, a container for the materials to be processed at high temperatures. These bronze building blocks were then sand blasted, fitted, and welded together to form the completed Brick House. There is only one step remaining: transporting the massive work of art from Philadelphia to New York, where it will be craned onto the Spur on the High Line in April 2019. Once it arrives in New York City, Brick House will peer down upon passing traffic along 10th Ave. and 30th St. and tower above park visitors. 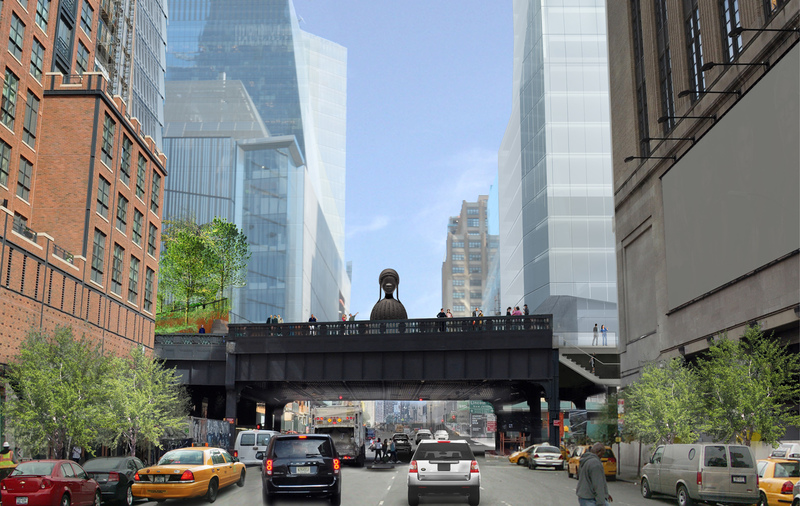 This is an exciting moment for the High Line, the vistas of the West Side, and all of New York: sculptural architecture meets historical architecture with an undeniable, and highly visible example of Black female representation. In New York City, there are a small handful of monuments depicting important African American figures in US history, including Frederick Douglass in Central Park, Louis Armstrong in North Corona, and Jackie Robinson in Upper Manhattan. Among them, only one is of an African American woman—Harriet Tubman in Harlem. This paucity reflects the general lack of representation of Black women, real or imaginary, in public sculpture in this city and elsewhere. This underrepresentation is compounded by the small number of permanent, public sculptures, (just four) figurative or abstract, created by Black women artists permanently on public view in New York. Surrounded by a competitive landscape of glass-and-steel towers shooting up from among older, industrial-era brick buildings, Simone Leigh’s magnificent sculpture will challenge visitors to think more critically about the architecture and aesthetics around them, and how they these structures reflect our customs, values, priorities, and society as a whole. With your tax-deductible donation, you’ll help make world-class contemporary public artworks accessible to everyone.